Trying to define preparedness or readiness can be a frustrating task. It turns out that while there are many definitions, most skirt the task of actually providing a useful definition. For example, Webster’s dictionary defines preparedness as “the quality or state of being prepared” (prepared is defined as “subjected to a special process or treatment”). Poor definition leads to poor comprehension, which impedes our collective ability to improve preparedness. 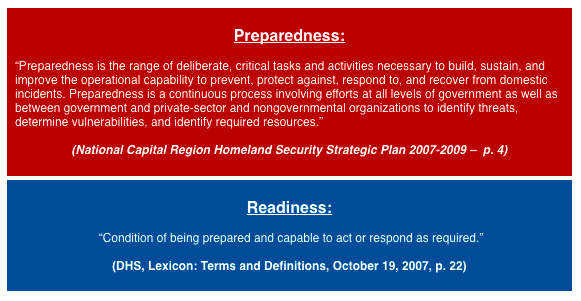 While the DHS Lexicon equates readiness with preparedness, I have a different perspective. In my opinion, preparedness is the sum of plans, policy, procedures, protocols, risk/hazard/threat/vulnerability identification/analysis, and development of training curriculum for incident response/recovery. In my opinion, readiness is somewhat different. 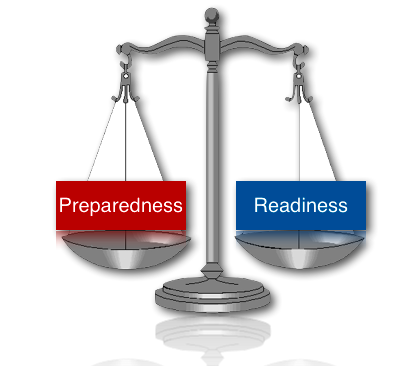 Readiness is the capability of successfully responding or conducting recovery operations (in other words, the ability to implement processes, procedures, etc included in preparedness). For example, police officers don’t have much preparedness on a normal patrol (a police car equipped with a shotgun and some flares) but police officers maintain a high degree of readiness (in the sense that they are able to respond quickly, understand how to order additional resources, and are generally well-trained). Developing the training is preparedness but ensuring that everyone is trained and able to execute their function is readiness. While the differences between the two concepts might seem slight, both concepts are crucially important to ensuring a proper balance between theory and practice in maintaining successful and progressive emergency management programs.